This is actually a double DVD. 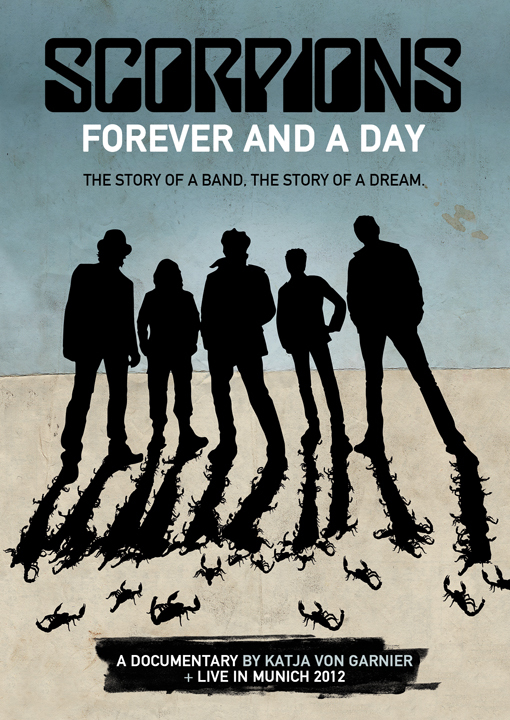 The first documents the longevity and history of the band from their early beginnings right up until their world farewell tour which ran from 2010 until 2012. It also marks in hindsight the farewell of drummer James Kottak, who has recently been replaced with Mickey Dee, formerly of Motorhead. The second part of the package documents a live show from Munich in 2012. The documentary works well with the former history being utilised and combined with the more modern footage. Normally I find movies/documentaries that regularly jump back and forward as distracting and off-putting, but in its favour this actually works very well on Forever and a Day. It is not just a musical story but the documentary is also an historical one. The band’s trips to Russia, the falling of the Berlin wall, all set to an enduring heavy rock back beat. It captures the band’s battle against a changing musical climate in the early nineties, and how they decided to experiment and evolve to ensure their longevity. There are the expected cameo appearances from other musicians paying tribute to the band’s legendary status, as well as also former Scorpions such as Michael Schenker and Herman Rarebell. Legendary producer Dieter Dierks, whose name is synonymous with the band, also makes an appearance. The band’s recording process in the studio is broken down and examined. These guys have been trend setters for that heavy rock musical genre from the country that is known for Beer, and their world class Oktoberfest Festival. Through Rock’s history we’ve had quite a few legendary bands that are known for their longevity in the scene; The Scorpions fit right up there when it comes to a definitive long career. As with tenure bands, at some point they like to call it quits, and so it happened in 2012 at the end of another successful world tour, the band threw the anvil down and decided to step way. Truth be told, when there is a high demand, you supply more. In this case the guys realised that stepping away wasn’t all that easy, as their popularity is still at a constant level. Klaus Meine himself admittedly said so. Their long-time running vocalist, now at the senior age of 67, instead decided to mix some downtime in between studio albums, instead of the constant grind of life on the road (A bit like Judas Priest decided to do). So with a new studio album released last year titled Return to Forever, the band’s eighteenth studio album, the band catapulted their way back into the scene, lined up another world tour and the Scorpions are back in business. Second part of the DVD is a straight live show from Munich 2012, showcasing all the Scorpions anthems from rockers, to the classic love songs. Illustrating that over fifty years later the band are still as relevant as they ever were. I for one hope that there will be more Scorpions shows hopefully in the UK, as I have only personally seen them once way back in 1986 at the legendary Monsters of Rock festival at Castle Donnington. The band once sang when passion rules the game – but it’s actually Scorpions musical genius that still rules the game.